The year is 3/4ths of the way completed, so I felt it was time for an updated Tallahassee housing market snapshot. Every so often, I like to just "listen" to what the data from the Tallahassee MLS is saying, as it produces a housing market snapshot that will tell us what to expect over the next few months. The real estate graph above shows that buyer activity is on the rise, and the one-year trend of daily closed home sales is stronger than it has been for two years. Needless to say, this is good news and we're moving (slowly) in the right direction. This next graph shows some key statistics that have me cautiously optimistic about the 2013 real estate market in Tallahassee. 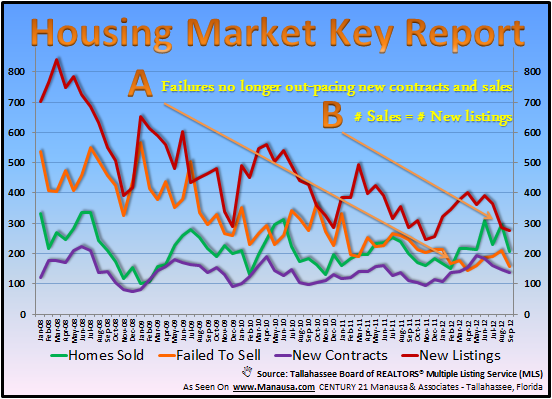 This graph in itself is a housing market snapshot, as it shows the monthly record of homes sold, homes that failed to sell, the number of new contracts posted to the Tallahassee MLS, and the number of new listings that entered the market. Two events have occurred recently that are worth noting. On the real estate graph above, point "A" shows that sales surpassed failures this spring and this relationship still remains. This means that for the first time in more than five years, home sellers have been successful more often than they have failed when they tried to sell a home. Point "B" is a recent event that occurred in August. And this event is truly noteworthy. New sales surpassed new listings in August 2012, and it is the only month that this has happened going back well more than five years, and most likely even further back than that. The only way to return to a housing market equilibrium is to return to a healthy balance between supply and demand. We will need many, many more months where sales exceed new supply, but posting the first one is a step in the right direction. All the signs in this Tallahassee housing market snapshot are positive ones. Of course, we did not include the new foreclosure filings that are on the rise, but even those are an important step in the return to "normal." By increasing the pace at which these properties enter and clear the market, the sooner we will find the bottom on values and a return to normal appreciation in our market. So our 2012Q3 housing market snapshot is positive, and it says that declining values are helping to stimulate buyer activity (demand). If you want to know how to put this information to work in your favor, just drop me a note and we can schedule a time to examine how the housing market snapshot applies to your specific situation and price range.